It felt like the first day of school; the growing sense of anxiety and apprehension wasn’t helped by the chronic tension that pervaded the London Underground; I felt my heart skip a few beats at my critical, perfectionist driven, mind made projections of looking foolish in a room full of advanced Ashtanga yoga teachers. I had kept the fact that I had never done an actual supervised Mysore class, quietly under wraps. With Mysore Ashtanga not being available in Malta, I had basically taught myself the complete series using my own teaching experience, logical discernment and Guruji’s old YouTube videos to figure out the whole sequence. I felt an ignorant desire to prove something as I clocked eyes with a few students and rolled out my mat. My ego was in fearful competition mode, what could I do but simply observe it patiently and non judgementally. When Manju entered there was little fuss or introduction. He simply walked to the front and began the opening chant. I watched myself cringe as I mumbled the Sanskrit words quietly to myself, recovering by projecting my Om shanti with as much gusto as possible; the human experience is so endearingly amusing at times. From the pressure I had put myself under during my first day’s Mysore practice, I had given myself a lot of neck and shoulder tension and a subsequent migraine for the next 2 days….jolting me back to my stressful migraine ridden years as a doctor; every day in medical training was about survival and proving ones worth and the competitive nature was one of the reasons I had left. As I spotted this fight or flight attitude swirling within me, I was able to slowly release it and consciously relax into my new environment, practicing yoga once again for myself and not for anyone else. I picked up a lot of invaluable suggestions and adjustments from Scott Johnson and Manju as they circled the room during our morning practices, including realising the cause and solution to my current wrist pain. A very subtle repositioning of the hand and applying a greater sense of control and lift from the core when jumping through completely removed all wrist strain in my practice. In the afternoon workshops, we largely focused on offering strong physical adjustments to really help to open out the deep tissues of the body. The adjustments were slightly more involved, deeper and took longer than those I had previously learnt. In a Mysore self practice type setting this makes a lot of sense as we would have plenty of time with the individual, but it would be challenging if not impossible to use most of these adjustments while trying to synchronise the flow of a led class. Full attention really needs to be on the individual student to give these deep therapeutic adjustments safely and this just isn’t possible in a led class without taking focus away from the rest of the students. This started a little internal conflict within me; should I be leading classes at all or teaching students to lead their own practice? I guess there is no right or wrong answer here, just a very different butterfly effect. Not forgetting that I began my epic yoga journey in a modern day flowing vinyasa class; perhaps it is not the method of yoga that matters, but the essence of our purpose, intention and message that we radiate out to the world as yoga teachers. 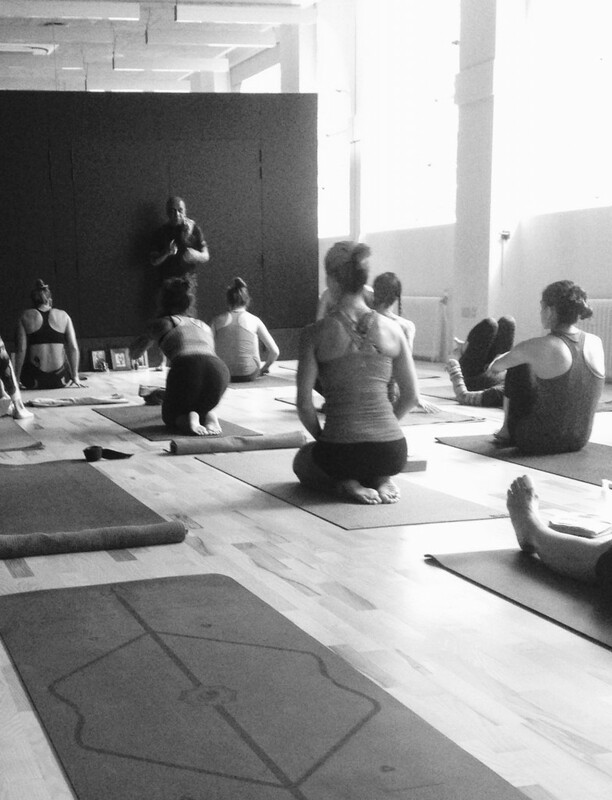 Throughout the course of the training, there was a deep shift in my perception of Ashtanga and thus my internal attitude towards my personal practice. I had began with a seriousness and an inner sense of striving and need to push forth and progress through the postures and series. By the end, I was relaxed and able to simply be present, observe and listen within, discerning what felt good for my body, essentially heeding what I always encourage my own students to do, I just needed to come back to my own inner wisdom. As a result, my practice had become much more explorative and insightful and I was completely at peace in the journey, moving very much into the realm of knowledge and healing in yoga therapy, Yoga Chikitsa, the name and essence of the primary series as Patthabhi jois had intended. 1) The primary series, yoga chikitsa, meaning yoga therapy, was used to heal the sick, weak and unwell; those that doctors had given up on went to see Guruji. Mysore style self practice Ashtanga yoga is truly intended for everyone and anyone wishing to heal themselves, physically, mentally and spiritually. When we see strong and flexible people do Ashtanga with great ease and control, this should not be taken as a starting requirement to practice, but should point to the potential physical and mental stamina gained from a patient and persistent practice. Through yoga therapy, we become increasingly pure, vital and functional in body, mind and soul. 2) The sun salutations were meant as a prayer and as such, adjustments should be avoided once the student has been adequately and safely shown how to do this. I interpret the non secular meaning of the word prayer to suggest a devotional practice by surrendering the ego and practicing being in complete presence, union and gratitude for all that exists in the universe in the here and now, a form of mindfulness meditation in which we are practicing an expansive awareness and consciousness. 3) There is no ‘right of way’ through the postures and between different series. When our body is safely ready to benefit fully from the next posture we can move onto it. Sometimes however, it takes an experienced teacher to be able to judge this safely for new students and in the beginning it is worth following their guidance to apply correct technique, maximise effectiveness and avoid injury. In yoga there should be no comparison or game of egos. We should treat ourselves and others with respect and compassion on our individual journeys. Honour the internal practice of yoga through deep inner observation and give up the show and all other external motives. Any competitive nature should immediately be trumped, along with all feelings of grandiose self worth as we ‘progress’. Destroy all belief of hierarchy and diffuse any feeling of jealousy as soon as it arises. We should remind ourselves that the true purpose of yoga is union, realising that we are all one….so who is judging who and who is more advanced than who? 4) ‘Stop talking about Bandhas and just teach the student to breath properly.’ There was an obvious disdain in Manju’s voice when someone posed a question about using Bandhas, telling us that his dad never spoke of Bandha and that all this talk of bandha is very much a dressed up thing of the west. When I asked, ‘so how would you teach a student to breath properly without mentioning bandhas?’ his response was simply ‘just teach them to breath properly’. Whilst it wasn’t the detailed response I was hoping for, it did make me step back and contemplate my experience a little more. One thing I had began to realise in my own practice was that Bandhas are very much a natural phenomenon of deep conscious breathing and I was automatically engaging ‘bandhas’ in my breathwork practices before I even heard the term. If I go back to the first time a teacher told me to engage my mula bandha, I remember awkwardly trying to squeeze my pelvic floor unnaturally without any obvious benefit or link to the breath. We do not need to ‘think’ about engaging Bandha in order to breath correctly. In fact, what I have found was that it sometimes caused great confusion and dis-coordination of the breath to the point that I had asked a student to stop thinking about it completely and just inhale deeply into the belly and exhale fully from the belly. What I am realising now is that the mind body connection is so intelligent that the intention to simply inhale and exhale slowly and fully, recruits and coordinates the right muscle groups to bring about the right energetic and pressure shifts (our so called Bandhas) within the pelvic and abdominal cavities. In trying to dissect out, explain and direct the different components of the breath separately, we are forgetting this natural integrated intelligence of our mind and body. We only need to practice with the intention of steadying and deepening the inhalation and exhalation and the body will deliver. Try this now, close your eyes, feel within and you will notice your core and ‘Bandhas’ at work. 5) The vinyasa count, dare I say it, is not important. Before I started the course, I was anxious that I was going through the count incorrectly to reach the state of asana and I asked if there should be an extra inhale or exhale here or there during the course. This fixed belief was stirred by various articles I had read about how Guruji entered this asana in ‘this many counts’ and that asana in ‘that many counts’. Now I realise that whilst Patthabhi did use the same count repeatedly, It was incorrectly and dogmatically interpreted. The vinyasa count does not matter, but what does matter is the true logic and beneficial nature of vinyasa, linking the correct breath to each movement. As we transition between postures, the nature of the movement will govern whether it is more natural to inhale or exhale through that transition. Anything that opens the chest and extends the spine is best coupled with an inhale and anything that closes the chest and rounds the spine is best coupled with an exhale. When we dive deep into our bodies, we can feel without doubt the sense and logic of applying vinyasa in this way; it just works. 6) Guruji always taught with love and treated everyone like family. When Manju spoke of his dad it always brought about a warm fuzzy feeling. Even watching Pattabhi teach on youtube gives me a deep sense of his love and compassion for his students. In that sense he reminds me very much of my old Master, Suh Ki Young. Regarding parampara, the transmission of direct and authentic knowledge through experience, there is one thing for certain that I believe transmits from guru to student. It is the sense from the direct relationship with the guru of the deeply grounding state of knowing, awareness and consciousness…..with it, the unconditional love, acceptance and compassion towards all that meet this space. That universal consciousness and love imprints onto you, deep within your soul and sets you on a course towards one day realising it yourself through your own journey, to one day begin transmitting it onto others. It is a transmission beyond ritual and words; it is a transmission of love.